There’s no point in making “regular” ice cream. The ingredients to make ice cream at home are fairly pricey and the quality ice cream you can buy at the grocer is about as good as you can make at home. So I pretty much only make boozy ice cream that you cannot buy. 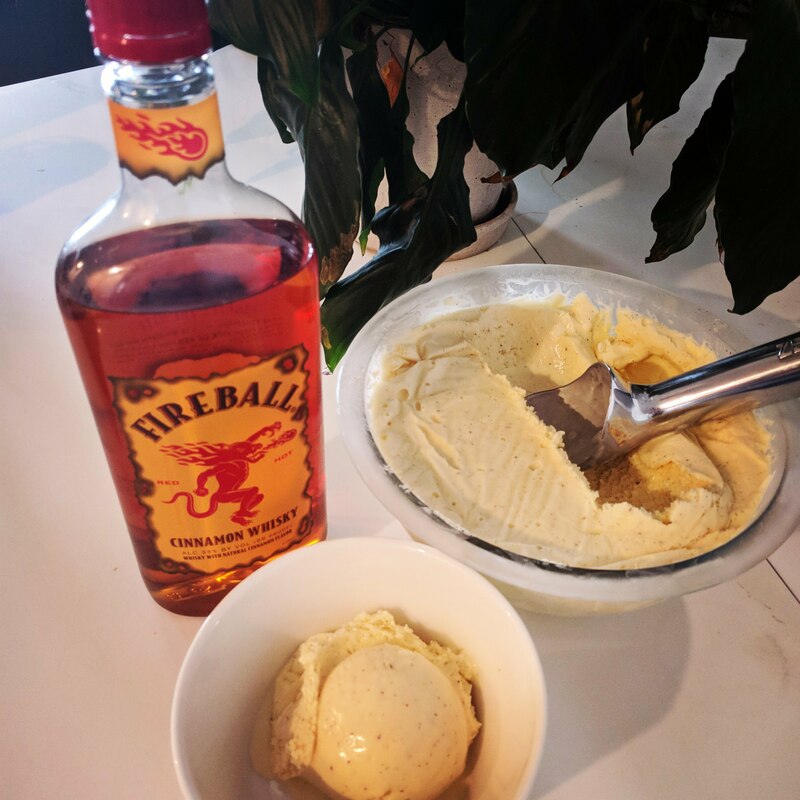 For reasons I forgot, I was challenged to make Fireball Whisky ice cream. Below is the recipe I used. I took a basic whisky custard recipe and adjusted it to my needs. I grated a cinnamon stick in the blender to add to the cinnamon punch of the ice cream. No clue if it was 2 teaspoons. Probably less. But you can always add more in after the cream starts churning in the ice cream maker to suit your needs. I know I added more than 1/3 cup Fireball because the ice cream is a little soft. I’m thinking that’s due to the alcohol preventing a full freeze. The original recipe called for 1/4 cup. But that’s not enough. So boost it to 1/3 cup but don’t go much higher like I did. 1 teaspoon fresh ground cinnamon + extra to taste. Take a cinnamon stick or two and pulverize it in a blender/coffee grinder/food processor. In a 4-quart saucepan, combine milk, cream, and roughly half the sugar. Set over high heat, and cook, stirring occasionally and not over-zealously, until the mixture comes to a boil, about 5 minutes. Meanwhile, in a medium bowl, whisk egg yolks and remaining sugar until smooth, heavy, and pale yellow, about 30 seconds. Return the pan to stovetop over low heat. Whisking constantly, stream yolk-cream mixture back into pan. With a wooden spoon, continue stirring until the mixture registers 165 to 180 degrees on an instant-read thermometer, about 2 minutes. Do not heat above 180 degrees or the eggs will scramble. The mixture should be slightly thickened and coat the back of spoon, with steam rising, but not boiling. Stir in the whisky. With a sharp knife, cut the vanilla bean in half lengthwise then scrape out the tiny seeds on the inside. Add the vanilla bean and the seeds to the cream mixture. Add the cinnamon to the cream mixture. Remove from heat and strain mixture through a fine mesh sieve into a bowl. Taste. If it needs more cinnamon….Whisk in the cinnamon then set aside to cool. When mixture has cooled a bit, cover and refrigerate for several hours until well chilled. Press plastic wrap over the surface to prevent a skin from forming. When the cream has fully cooled (at least three hours in the refrigerator), pour it into the ice cream maker and follow the vendor instructions from there.